Kabafunzaki is escorted to a waiting Police car after he was netted at Serena Hotel. Courtesy Photo. State Minister for Labour, Employment and Industrial Relations Herbert Kabafunzaki has been charged with corruption and remanded to Luzira Prison. Kabafunzaki appeared before the Anti-Corruption Court Chief Magistrate Agnes Alum alongside his personal assistant Brian Mugabo and an interior designer Bruce Lubowa. They were charged with three counts of corruption and conspiracy to commit a felony. Two of the accused persons; Kabafunzaki and Lubowa denied the offense. 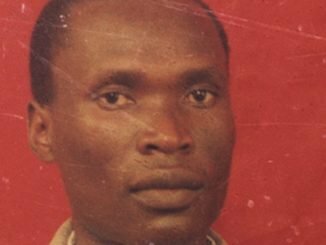 However, Mugabo pleaded guilty and admitted to hiding a bribe of 5 million Shillings on behalf of the minister. He says his action was to protect the minister from punishment. 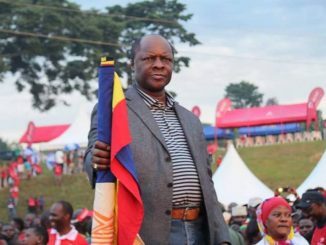 The minister was arrested from Serena Hotel in Kampala on Saturday April 8, for allegedly soliciting a 30 million Shillings bribe from Hamid Muhammed, the proprietor of AYA Group of Companies. 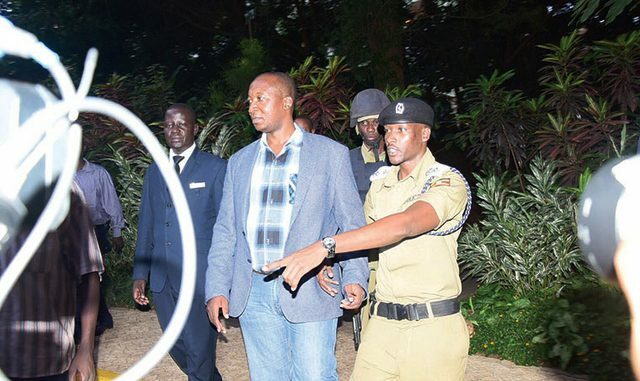 Kabafunzaki allegedly solicited the bribe to help Hamid clear his image following a complaint of sexual harassment filed by one of his former employees at the Nakasero based Hilton Hotel. The employee had lodged the complaint with both police and with Kabafunzaki, in his capacity as the labour minister. Kabafunzaki had two days earlier led a team of officials from the Ministry of Gender to Kampala Hilton Hotel to examine allegations against Hamid. Today, court heard that Lubowa conspired with the minister to solicit for the bribe and accepted to receive an installment of 5 million Shillings on Saturday; the day they were arrested. But Kabafunzaki denied the allegations and told court that he did not receive any bribe and neither did he plan to meet Mohammad Hamid on the fateful day. “I didn’t plan to meet anyone from AYA, I was having lunch with my daughter at Serena Hotel. It was a set up,” Kabafunzaki says. The trio has been remanded until tomorrow when they will re-appear for a ruling on their bail application.